Original Yanks - Want to be a member? Thought about joining? What does it take to be a member? Do I need experience playing a brass instrument or drum to join? - While it is a benefit to have experience playing an instrument, it isn't a requirement. We can help you learn if you have the desire and committment - and if you do know how to play an instrument and have never marched before we can train you! What if I'm not musically inclined? Is there a place for me? - Of course! You can be in the colorguard and carry a flag or rifle, or be on our staff and help us with carrying water during a parade, assist with uniforms or drive the trailer! Do I have to attend every parade? What are the attendance requirements? - While we encourage members to attend every parade, we do ask that you make as many as you can - barring work or school commitments. We are a volunteer organization, so no one is paid, but being a marching band it is important that as many members attend every parade to assure continuity and great sound! What are the age requirements? What does it mean to be a "Senior" Drum and Bugle Corps? - There is no maximum age however, we generally only accept members 13 years and older. Some of the instruments are quite heavy, and some parades can be up to a mile long, so the member has to be able to carry his or her instrument the entire length. We do require parental or guardian sponsorship for any one under the age of 18. Members who are in school marching band agree that school band comes first, and Drum Corps second when there is a conflict. Do I have to buy my instrument or uniform? - Bugles, Drums and all colorguard equipment is provided as well as your entire uniform. All we ask is members to do is to provide their own boots (black wellington style) - mostly because members prefer their own footwear. Is there a huge time commitment? I've heard Drum Corps takes a lot of time - entire weekends in some cases. How much time do I have to invest? - Since we are a "Street Corps" we don't participate in the competitive events that DCA/DCI corps do. 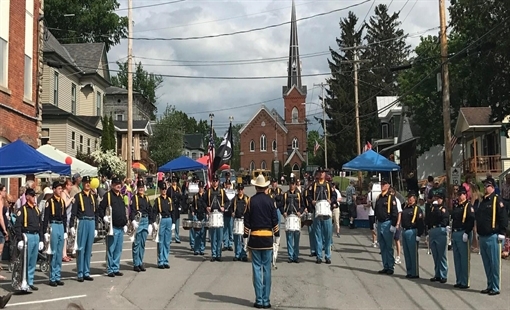 We practice 3 hours a week on Sundays from January to May, and then we have about 15 to 20 parades and/or concerts from the middle of May until Labor Day. We understand there is a life beyond Drum Corps and we keep that in mind by not booking every weekend during the summer. You can expect that a parade or concert will take about 2 to 3 hours in most cases. This all sounds great - how do I join? - Go to our contact page and contact us and we will answer any other questions you may have to get you started!